We’ve often wondered how Word of Faith heretics read their bibles. The Old Testament has books like Ecclesiastes and Lamentations that are often hard to read because of their tone. These books are God breathed and as believers we know “Thy word is true” (Psalm 119:160). So how does a Word of Faith heretic like Brian Houston approach these weighty, sobering books? The Word of Faith cults teach we are to align inner and external worlds to our lips and then to speak the things of our heart, mind and spirit into existence. Remember – a Word of Faith heretic teaches that the power of the tongue speaks life or death. This means they rather speak life and motivation into their members to see them prosper and flourish. They convince themselves that God speaks loving, life-filled motivating words to get us through the day. So it is hard to find a sermon where they tackle doctrines like sin, depravity, wickedness, justice, wrath. You know, the “depressing stuff” that may have to flow up to their tongue and speak about to their congregation. How do they deal with the negative tone and depressing subjects the bible talks about – specifically in Ecclesiastes or Lamentations? Brian Houston enlightens us below on how Word of Faith heretics view the “negative” scriptures. 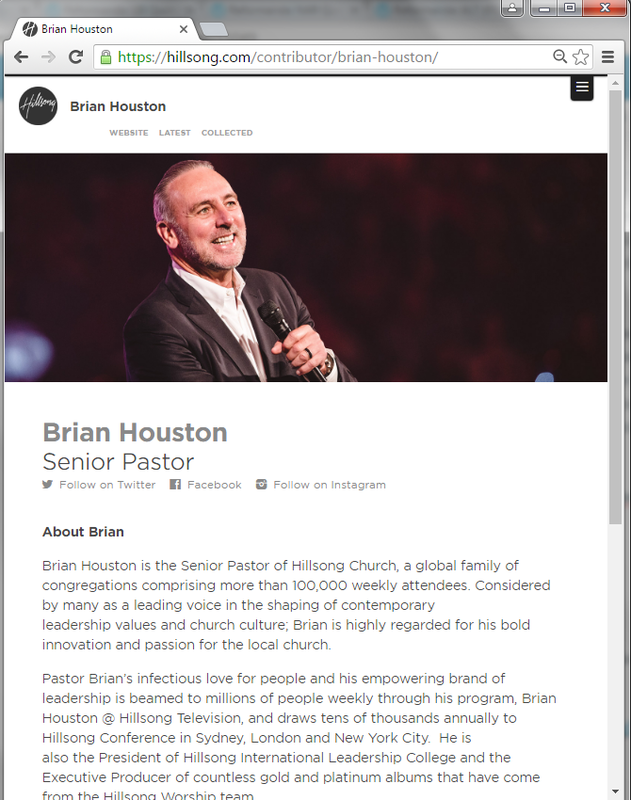 Brian Houston prides himself of being the “Executive Producer of countless gold and platinum albums that have come from the Hillsong Worship team”. Brian Houston is the Senior Pastor of Hillsong Church, a global family of congregations comprising more than 100,000 weekly attendees. Considered by many as a leading voice in the shaping of contemporary leadership values and church culture; Brian is highly regarded for his bold innovation and passion for the local church. Pastor Brian’s infectious love for people and his empowering brand of leadership is beamed to millions of people weekly through his program, Brian Houston @ Hillsong Television, and draws tens of thousands annually to Hillsong Conference in Sydney, London and New York City. He is also the President of Hillsong International Leadership College and the Executive Producer of countless gold and platinum albums that have come from the Hillsong Worship team. It is important to remember that Hillsong have no problem elevating the lyrics in their music to a higher level than “God-breathed” scriptures. If you think that is blasphemy, (consider how Hillsong have continued to leave up this blasphemous advert from the 26th of June, 2014, to now – the 14th of May, 2016), it gets worse: Brian Houston does not believe that the bible is infallible. However, back in 2008, Brian Houston claims in his book ‘For This Cause I Was Born’ that “Solomon may have been in a bad spiritual state when he penned these words” in Ecclesiastes 3. A “bad spiritual state” when Solomon himself penned scripture? Brian, what makes you believe that a biblical author writes in a “bad spiritual state” but your worship team can pen “God-breathed” lyrics and “new revelation”? We have looked at the context of this thoroughly. The word “may” is not dropped in that sentence as a suggestion by Mr Houston. It is placed in such a way as to say that Solomon was in a bad spiritual state when he penned Ecclesiastes even though he understood the value of time relation to God’s purpose. Mr Houston has confirmed to us that a Word of Faith heretic cannot see scriptures that deal with negative issues can come from God. This may explain why Brian Houston drops his Hillsong worship lyrics in his books just as much as scripture. And Hillsong wonders why Christianity considers Hillsong a cult? If Houston does not believe the bible is infallible, he is accountable to no one. Not even God. Source: Brian Houston, For This I Was Born, Nashville: Thomas Nelson, Inc, 2008, Page 115. I attend an SBC who sings Hillsong. I fervently read my Bible when they sing these songs or leave the sanctuary. whenever i hear them i puke.